The Coleman National Fish Hatchery (CNFH) on lower Battle Creek near Redding, CA (see map below) was constructed in 1942 to mitigate for the Shasta Dam project on the Sacramento built just upstream from Redding. It annually produces 12,000,000 fall-run salmon smolts and a million late–fall-run salmon smolts. Operation of CNFH is in need of reform because it fails to meet its mitigation goal and because it may interfere with the Battle Creek Restoration Program (BCRP1). Efforts to improve salmon runs in recent drought years by trucking smolts to the lower river and Bay-Delta have resulted in increased straying of CNFH adult salmon to other Central Valley Rivers.2 Releasing millions of smolts into lower Battle Creek at the hatchery negatively affects wild smolts emigrating from Battle Creek through competition and stimulation of an annual spring striped bass feeding frenzy in the Sacramento River.3 Straying also limits adult salmon return to the hatchery and in some years makes it difficult for the hatchery to meet egg quotas. Plans to reduce these conflicts have drawn criticism from fishermen groups4 because of the potential of reducing smolt production and survival, and subsequent fishery harvests. CNFH production likely contributes a third or more of California’s ocean and freshwater salmon catch, and is a major contributor to natural salmon spawning in the Central Valley. 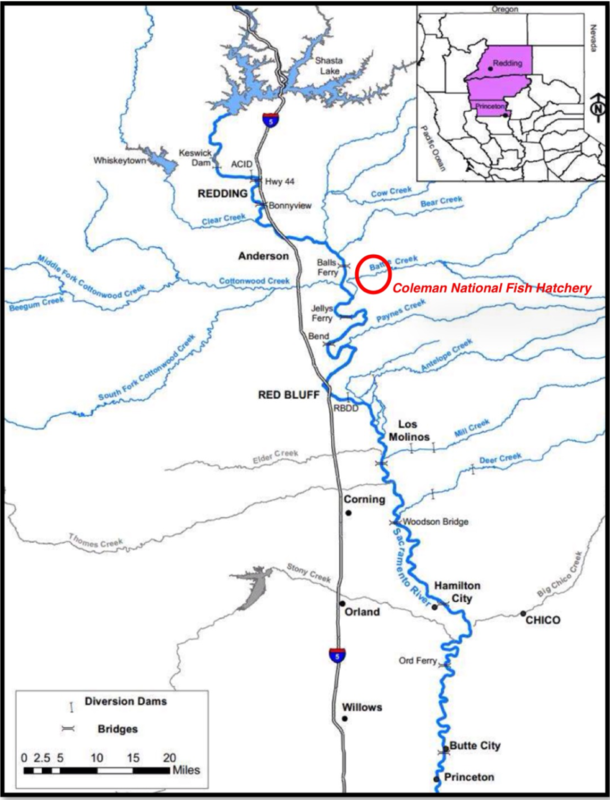 In the Central Valley Salmon Recovery Plan (NMFS 2009/2011, p. 201), NMFS suggests moving the production hatchery to the Sacramento River from Battle Creek to reduce conflicts. The existing hatchery could be used as a conservation hatchery to support recovery of wild Battle Creek salmon and steelhead. 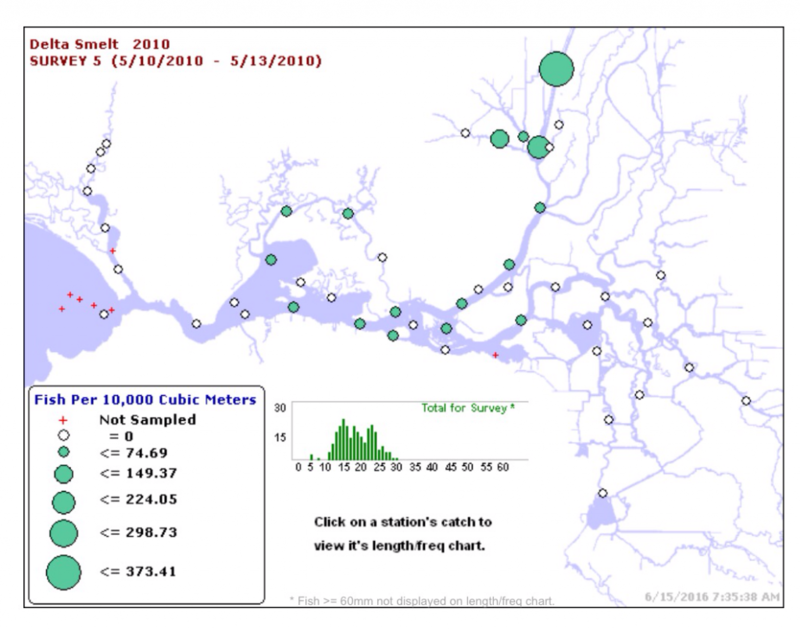 Fall-run salmon smolt production should be trucked/barged to the Bay to maximize contribution to fisheries, recognizing substantial straying of fall-run occurs throughout the Central Valley. Barging smolts from above the mouth of the Feather River to the Bay should reduce straying to the Feather, American, and San Joaquin rivers and their tributaries. Fall-run CNFH fry can be trucked/barged to high quality lower river floodplain and tidal estuary habitats historically important to fall-run, but presently unavailable or unreachable. Such habitats were important and reachable before the dams were built. Late-fall-run and steelhead smolts should be released at the hatchery in wet winters, but barged to the Bay in dry years. 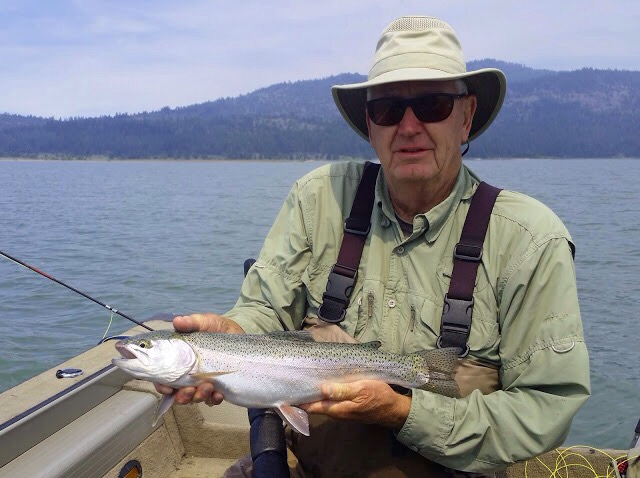 Lake Davis is a popular Sierra trout fishing destination in Plumas County near the town of Portola, California. Lake Davis was created in 1966 when the California Department of Water Resources dammed Grizzly Creek, a tributary of the Middle Fork Feather River, as part of State Water Project. The lake is perhaps best known for its decade-long battle over northern pike extermination efforts by CDFW that ended successfully nearly a decade ago. Controversy now returns to the lake’s fishery, because catch rates for trout have plummeted again, similar to their decline when pike spread in the lake. This time, the problem seems to be either over-harvest by fishermen or cutbacks in CDFW’s stocking program since the huge hatchery plantings that followed the poisoning of pike (and trout) in the lake a decade ago. Did fishermen become spoiled and harvest too many fish? Or has the state become stingy with its fishery stocking and management programs? Some speculate the state has become vindictive to ongoing lawsuits brought on by the town government by holding back on stocking. Others note that overall hatchery production, especially of the popular Eagle-Lake strain used in Lake Davis, has suffered during the recent drought. Regardless, the issues beg the question of whether changes are needed in managing some Sierra lake fisheries, if only to protect fragile local Sierra community economies sustained in large part by recreation. Like many other popular Sierra lakes, Davis is managed by CDFW as a Hatchery Supported Trout Water. It is stocked and managed as a Put-and-Grow and Put-and-Take water. Such waters are capable of supporting trout growth and carry-over survival, but have limited capacity for natural reproduction. For Put-and-Grow fisheries, hatchery-produced trout 3-6 inches in length are stocked periodically to augment the trout population. Put-and-Take waters are stocked with catchable-sized hatchery trout in support of intensive fisheries to support waters near campgrounds, roadsides or other high access areas where angling demand is high, and where anglers often want to keep some fish. California is blessed with many such public waters sustained by CDFW and public utilities’ stocking. At Lake Davis, many locals, visitors, and guides have noted a gradual decline in catch rates of trout, but an increasing average size of trout over the past four to five years. Catch rates including my own have gone from 20 to 10 per day to 5 to or even 1 or 2 per day. Average size has increased several inches to 20-22 inches, with larger fish common. Rather than faster growth, it appears more fish are reaching their terminal age of 4 to 5 years. A lack of smaller size trout in catches may indicate reduced stocking or poor survival of the 3-12 inch hatchery fish. Harvest rates of 5 per day are allowed, with 10 in possession. The season is openyear round, and ice fishing is popular. Winter-spring harvest of adult trout near the mouths of spawning creeks is allowed, whereas some other Sierra lakes open in April or May to protect spawning fish. Other quality Sierra lake fisheries have reduced harvest rates of 2 fish per day. Regardless, the lake attracts many diverse fishing interests who have been attracted by high catch rates and the large size of trout over the years. Other than stocking more fish or restricting harvest, what else could be done to improve the lake’s fishery? One option I would recommend is raising catchable and trophy sized trout in pens using local funding. This approach was recently begun at Englebright Reservoir on the Yuba River.3 It is gaining favor throughout the West for enhancing popular high-intensity trout lake fisheries where there is limited natural production and limited conflict with wild-trout populations. On Davis Lake, Honker Cove or the Dam Cove would be good locations for such an endeavor. I would also recommend stocking more sterile triploid trout, as they may grow faster and survive better to older ages by not having the urge to undergo the rigors of spawning. Over the past month I related water issues involving Delta and longfin smelt, striped bass, green and white sturgeon, and winter-run and spring-run salmon. All of these species need river flow and cooler water over the next several months. Shasta releases to the upper Sacramento River need to be cold, stable, and sufficient to sustain winter-run salmon eggs in the river near Redding and to sustain moderate flows and cooler water temperatures for 200 miles of river to protect sturgeon and other lifestages of salmon. Sufficient flows needs to pass through the Delta to keep the low salinity zone downstream of the Delta in the cool waters of eastern Suisun Bay, away from Delta exports. 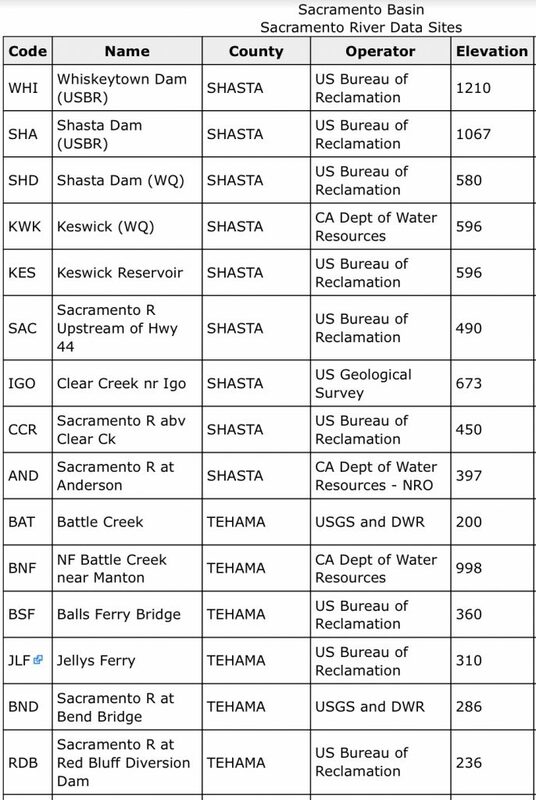 Shasta releases are now 8000 cfs, with Bend Bridge water temperature near the Red Bluff target of 56°F. In June and July of drought years 2012 and 2013, releases were 11,000-14,000 cfs. However, concern over carryover storage and sustaining cold-water releases through summer has led to a more conservative management strategy in 2016. The cold-water pool in Shasta Reservoir is being rationed to make it through the summer. Flows will rise over the next six weeks to 9,000 or 10,000 cfs to satisfy irrigation demands in the upper river. Flows in the lower Sacramento River at Wilkins Slough need to be greater than 5000 cfs in summer, if only to keep water temperature down closer to the Basin Plan’s 68°F. Flows are now 3000-4000 cfs, with water temperatures up to 75°F. 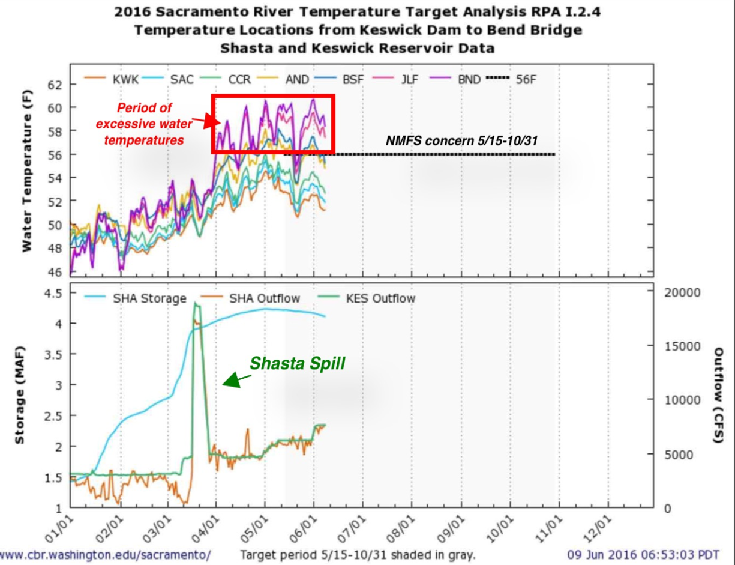 In dry years 2012 and 2013, flows at Wilkins Slough were 6000-9000 cfs, and water temperatures were cooler, as some of Shasta’s storage was allocated for Delta export. This year’s management strategy to hold back Shasta releases will, if continued, keep both Wilkins Slough flows and Delta exports down. Delta outflows need to be sustained near 10,000 cfs to keep the low salinity zone and X2 (2 ppt salinity) near Collinsville in eastern Suisun Bay. 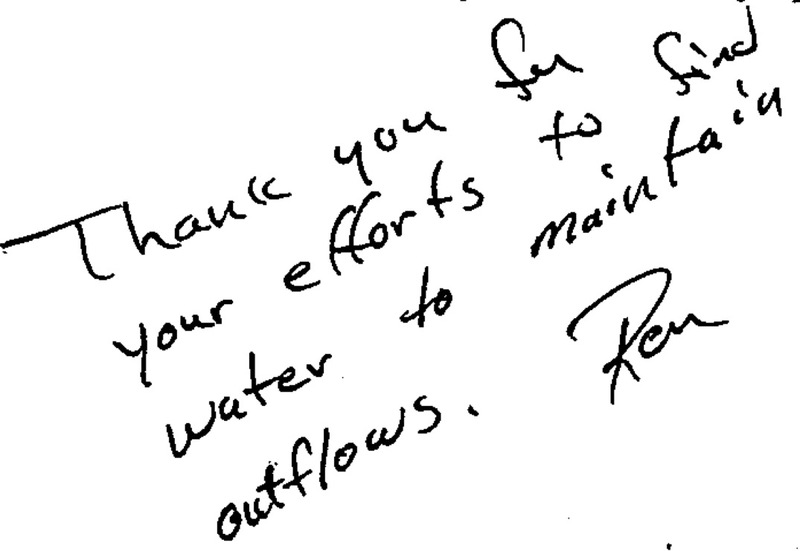 However, July outflow to the Bay required by water quality standards will be only about 8000 cfs. To help save the last of the two smelt species, 10,000 cfs would be far better. This solution of raising total reservoir releases to 22,000-24,000 and Bay outflow to 10,000 cfs is reasonable to help the fish after four years of drought. In 2014-2015, water quality standards were drastically reduced, with catastrophic effects to fish. The continuing legacy of these catastrophic effects creates the urgency to do better in 2016. If higher releases from Shasta become problematic for whatever reason, then some compromise should be achievable, noting that water deliveries of Shasta water are to be provided only after the needs of the fish are first considered, including conservation of Shasta’s cold-water pool through the summer and early fall (Water Rights Orders 90-05 and 92-02). Further, Central Valley water rights are provided via the Trinity River trans-basin diversion to Keswick Reservoir on the Sacramento River below Shasta Dam, but the Trinity supply is much in doubt because Trinity storage has failed to recover after the drought, unlike Shasta storage. A lack of Trinity supply this summer will further limit water available for irrigation in the Central Valley. Yet another constraint is whether the available storage in Oroville and Folsom reservoirs is able to satisfy Delta demands without compromising the needs of endangered fish in the Feather and American rivers. Below Shasta – Stable flows of 9,000 to 10,000 cfs and 56°F average daily water temperatures near Red Bluff (Jellys Ferry or Bend Bridge). Delta Outflow – 9,000 cfs in July, 5,000 cfs in August, and 4,000 cfs in September. 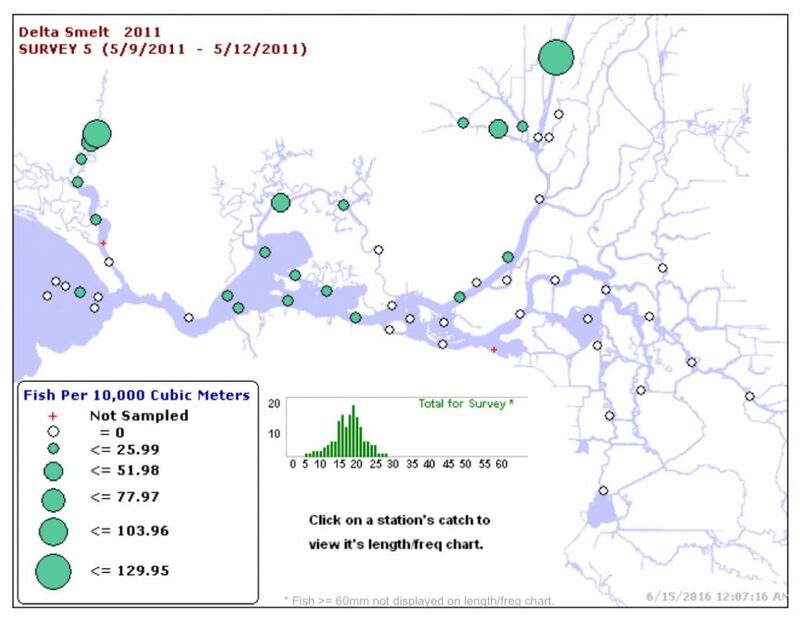 Before the 2012-2015 drought, Delta smelt had a recovery period in 2010 and 2011. Now, in 2016, there remains an opportunity for some form of recovery, albeit small. What is needed is exactly what the US Fish and Wildlife Service has been pleading for so far this spring to save Delta smelt: more Delta outflow. 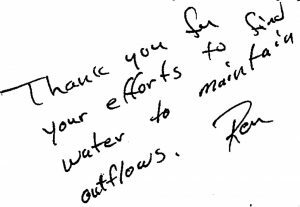 This note was at the bottom of the USFWS’s last Delta smelt determination memo to the USBR on June 1, 2016.1 This literally was their last action this year under the Delta Smelt Biological Opinion because there are no protections in summer once the South Delta reaches a water temperature of 25°C (77°F). A careful look at the four figures below indicates that there remains a chance to recover smelt this summer. There is a concentration of Delta smelt near Sherman Island in the west Delta (figure 1). If these smelt can get to Suisun Bay in the coming weeks as they did in 2010 and 2011, where habitat is better and where they are away from the influence of the south Delta exports, then they have a chance. To move the largest remaining concentration of this species in existence downstream, it will take outflows of about 10,000 cfs. Right now outflows are about 7500 cfs (see chart 1, below), the minimum required under present water quality standards. The fisheries agencies and the water projects need to find a way to make up the difference as soon as possible. Chart 1. 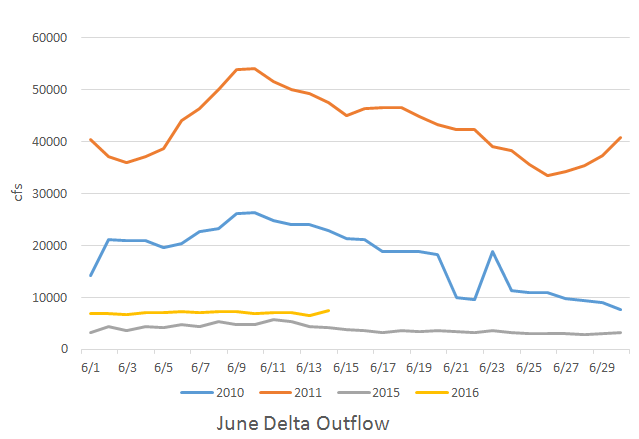 Delta outflow in June 2010, 2011, 2015, and 2016. 2011 was a Wet year. 2010 and 2016 are Below Normal water years. 2015 was a Critically Dry year. Figure 1. 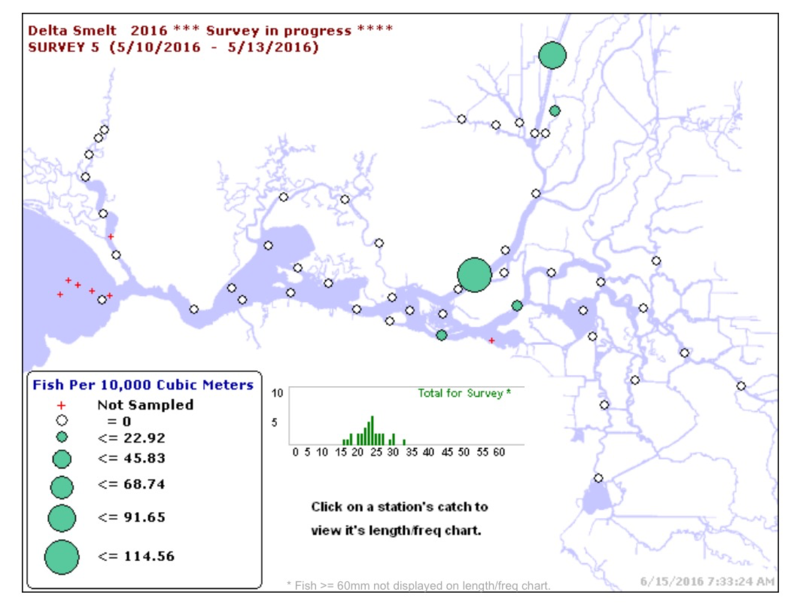 Mid-June 20-mm Smelt Survey 2016. Largest green dot is in north side of Sherman Island in Sacramento River channel of west Delta. Figure 2. Mid June 20-mm Smelt Survey 2010. Note smelt length-frequency chart at bottom-center of chart, which also depicts total caught in survey. Figure 3. Mid-June 20-mm Smelt Survey 2011. Figure 4. 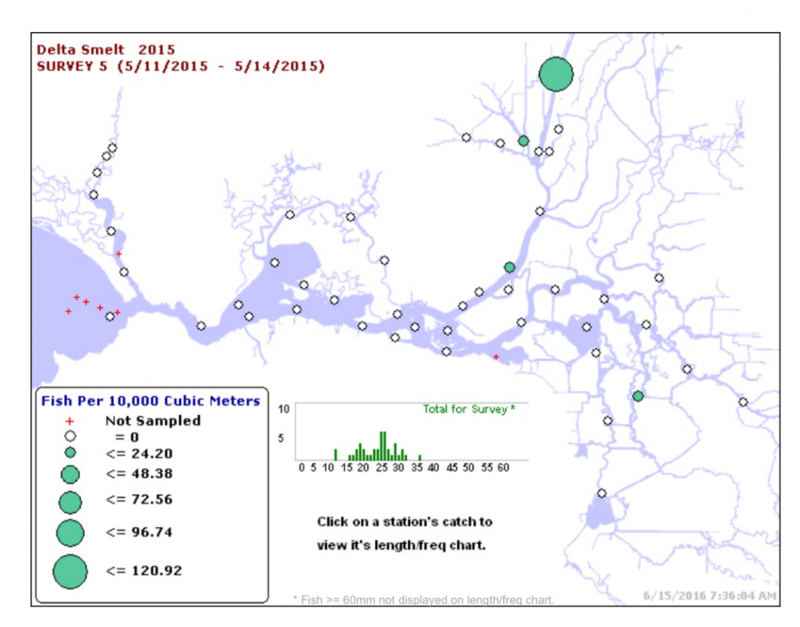 Mid-June 20-mm Smelt Survey 2015. Large green dot is in Sacramento Deep Water Ship Channel. Management of flows and water temperatures in the upper Sacramento River near Redding for endangered salmon is frequently presented to the public as complicated, but it is really not that difficult to understand. Chart 1 below depicts about everything that is involved with Sacramento River flows and their history so far this spring. The box outlined in red indicates what has been wrong this spring. The high temperatures shown in this box have hurt winter-run salmon, spring-run salmon, late-fall-run salmon, and green sturgeon, as well as fall-run salmon, steelhead, trout, and white sturgeon. All of these species have suffered unnecessarily from this spring’s water management below Shasta. Chart 1. Latest update (6/9/16) from USBR on management of the upper Sacramento River below Shasta for winter-run Chinook salmon. The “spill” in late March was a managed flood release of over 200,000 acre-feet of storage, which kept Shasta (SHA) from filling (4.5 MAF). A key list of the location abbreviations pictured can be found in Table 1 at end of this post. A map of the locations is shown in Chart 3. The red box in Chart 1 shows that water temperatures since April 1 have exceeded the 56°F target water temperature as defined in the State’s Sacramento Valley Basin Plan, the State’s Water Right Order 90-05 for Shasta Reservoir, and NMFS’s Biological Opinion for salmon and sturgeon as it applies to Shasta operations. These standards have been in place for many decades and are based on sound science. In an April 22 letter to Reclamation, the Pacific Fisheries Management Council recommended a 56°F compliance point at Jellys Ferry (JLF). That too has been exceeded in May and June. In a May 2 letter, NMFS changed the compliance point to Keswick Dam: “We will continue to use the maintenance of 52°F daily average temperature (DAT) at Keswick Dam as an indicator of the ability to meet 55°F 7-day average of the daily maximum temperatures (7DADM) at the Bonnyview Bridge temperature compliance point (CCR CDEC location) throughout the temperature management season.” Note this new Keswick criterion was not met in late April or early May, but seems to be controlling after mid-May (Chart 1). So why has there been so much compromise this spring (red box, Chart 1)? Why not simply meet the longstanding objective of keeping the daily average water temperature at Bend (BND) near Red Bluff? The reason is an unfounded fear by the managing agencies that they will run out of cold water in Shasta before the end of summer, as occurred in 2014 and 2015. Storage in Shasta in spring 2016 started with 4.2 maf. In contrast, storage in Shasta in spring 2014 and 2015 started out at 2.4 and 2.7 maf, respectively. Storage in Shasta in spring 2013 started out at 3.8 maf and met the standard. Storage in Shasta in spring 2009 started out at 3.2 maf and met the standard. There was more cold-water volume stored in Shasta this spring than the total spring storage in 2009 or 2013. Between March 18 and March 28, 2016, a “flood release” of over 200,000 AF occurred, but the reservoir storage still rose from 3.9 to 4.0 maf. Most of the water released during the flood release was warmer surface water (Chart 2). Even then, the average water temperature from the surface outlets (upper gates) was only 48-50°F. There is simply no information that indicates the reservoir will run out of cold water by the end of summer. Even Reclamation’s own conservative modeling indicates that a compliance point of 56°F at Balls Ferry can be met, which appears to be the present target in early June (Chart 1). In conclusion, there is no reason why the Bend or at least the Jellys Ferry 56°F compliance point cannot be met. Perhaps more important is NMFS’s prescribed 9000 cfs June Keswick release. The lower release of 7500 cfs so far in June has resulted in (and allowed) the increased water temperature at Bend (and Red Bluff). These low flows and higher temperature (60-62°F at Red Bluff and higher downstream) have, in addition to adding stress on winter-run salmon, also jeopardized green sturgeon, white sturgeon, spring-run salmon, and steelhead (see previous post). Of the present 7500 cfs release, over 5000 cfs is diverted by downstream Sacramento CVP water contractors. An extra 2000 cfs Keswick release would increase mid-river flows at Wilkins Slough from the existing level of 3000-4000 cfs to 5000-6000 cfs, which would lower Water temperature at Wilkins at least several degrees from daily highs of 75-78°F, which are lethal to migrating adult salmon and young sturgeon. Chart 2. 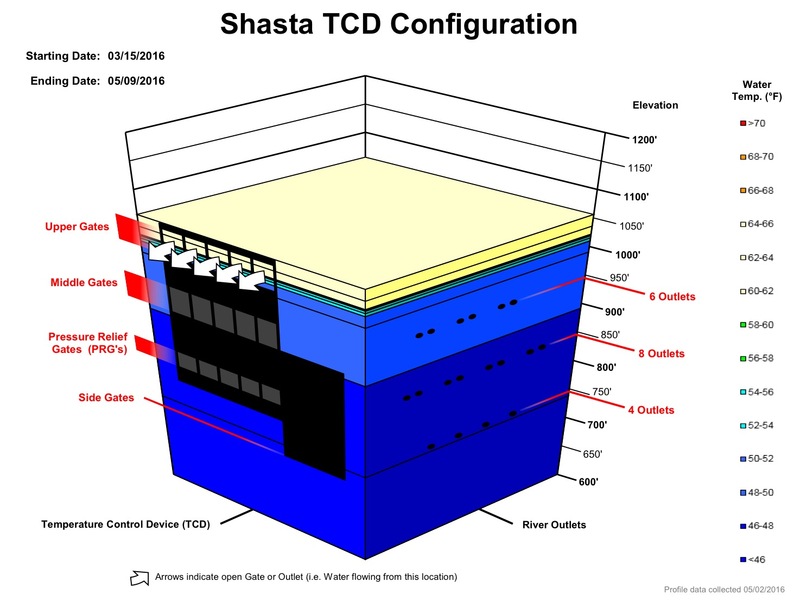 Shasta Dam Temperature Control Device configuration on March 15, 2016. Chart 3. 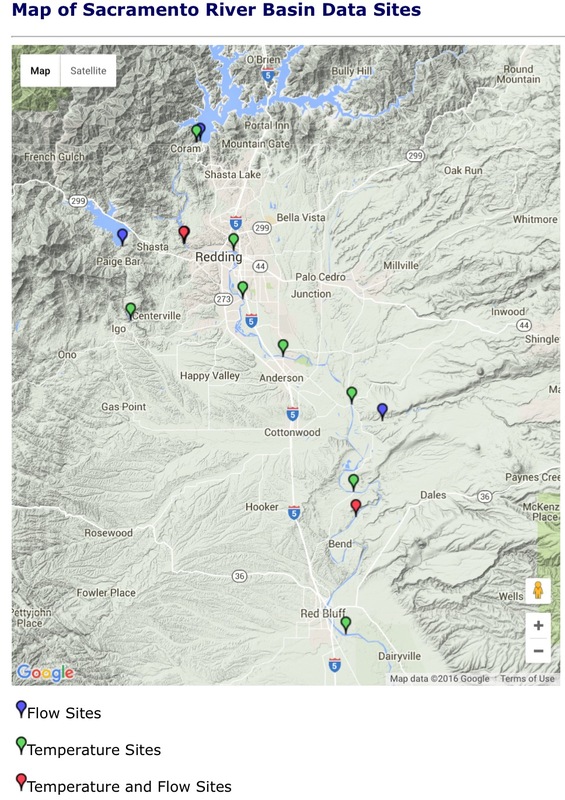 Map of key monitoring stations in upper Sacramento River below Shasta. Table 1. List of abbreviations for locations in Chart 1. A map of locations is shown in Chart 3 above.